I was born on the same day as boxer Cassius Clay, also known as Muhammad Ali. Some may argue this accounts for the fact that I injured three other boys at school when I was young. But don't worry: I'm a rather placid man these days. Since Cassius Clay was born on 17th January 1942, you can imagine the self-appointed curator of the Overtom Chess Computer Museum had something to celebrate today. I received many congratulations, for all of which I'm quite grateful. For those who wonder what the text in the top left hand corner means, it is a Dutch phrase for congratulations. So if you're invited to the birtday of Queen Beatrix, you'll know what to say. 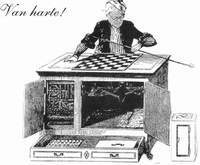 As to the oriental-looking figure, those who know something about the history of chess will recognize the Turk, an automaton which could play chess (through a dwarf hidden inside the cabinet). In fact, the Turk was a great conjuring trick. But only very few will know that this Turk's face shows a striking resemblance to the countenance of the self-appointed curator of the Overtom Chess Computer Museum .